Is the spread of religious communities related to economic risk? Historically, religious communities have often been the only source of support beyond the family. The social support provided by religious communities appears to be a type of informal mutual insurance especially valuable in historical agricultural societies exposed to much economic risk and without formal insurance mechanisms. 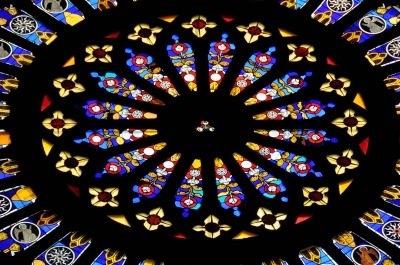 Economic risk could therefore have contributed to the spread of today’s major religious communities, and beliefs in the spiritual rewards of mutual aid and charity, but empirical evidence is lacking. In their new EHES working paper, Philipp Ager and Antonio Ciccone use historical census data for the United States to examine the link between economic risk and the spread of religious communities. The authors’ central conclusion is that religious communities are more widespread where populations face greater common risk. The paper integrates two existing ideas – religious communities can sustain mutual insurance against at least some risks, and religious membership is a social activity that reduces time for other activities – into a model where agricultural output of farmers in a location is subject to idiosyncratic risk and to common, county-level rainfall risk. While idiosyncratic risk is partially insurable within a county’s religious communities, common rainfall risk is not. The authors show that when relative risk aversion is in the empirically relevant range, the value of mutual insurance against idiosyncratic risk within a county’s religious communities increases with common rainfall risk. This implies that a larger part of the population will be members of a religious community in counties with greater rainfall risk, holding expected agricultural productivity constant. Ager and Ciccone evaluate this hypothesis by examining whether in the nineteenth century United States, churches in counties with greater rainfall risk had more total members or a greater combined seating capacity relative to population. In the United States, religious communities are widely regarded as having been the main source of social assistance, especially in agricultural regions, until the rise of government social spending at the beginning of the twentieth century. The available financial accounts of nineteenth-century churches indicate substantial expenditures on local relief and charity. There is also extensive historical evidence that local religious community members supported each other in case of need. Consistent with the historical narrative and the theoretical analysis the authors find a statistically and quantitatively significant link between membership in religious communities and rainfall risk in 1890, 1870, and 1860. This blog post was written by Philipp Ager, Assistant Professor of Economics at the University of Southern Denmark, Odense. Does contemporary economic development have medieval roots? Numerous studies suggest that the institutional, educational and technical innovations connected with the commercial revolution in the late medieval laid the ground for the later European Industrial Revolution. However, the late middle ages also saw another institutional innovation, namely the emergence of participative political institutions (PPIs) in cities that have not been systematically analyzed until now. The development of these institutions marked the first turn towards more inclusive institutions since the ancient world. 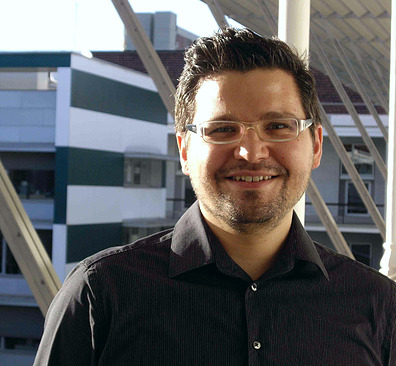 The recent EHES discussion paper by Fabian Wahl seeks to understand the consequences of this gradual shift of political institutions towards the participation of larger groups of citizens for the development of cities in the subsequent centuries. In doing so, it is the first study exploiting the remarkable heterogeneity in the participativeness of political institutions in the cities of the Holy Roman Empire in the later medieval and early modern period. Concerning the consequences of participative political institutions for long-run city development, existing studies came to different conclusions. On the one hand, one can expect them to have a positive effect as they are associated with limited government, increased checks and balances, better fiscal and economic policy, a more credible commitment to property rights, less inequality and more civic capital. On the other hand, it is also known that, given the nature of the political system of medieval cities, those institutions could also give rise to rent-seeking, oligarchisation and conflicts within different groups of the elite. Moreover, the participative political institutions in medieval cities were closely connected with the empowerment of guilds. As there is an ongoing scholarly debate about whether the impact of guilds for economic prosperity was positive or negative one should not have a clear expectation about the effect of these institutions. Instead, it is likely that the effect of different types of participative political institutions is different and probably short-living. The main data used for the empirical investigation of these issues originate from the “Participative Political Institutions in Pre-Modern Europe” database created by the author (Wahl 2014). This database contains information on the three most important types of participative political institutions in 104 cities in Germany, Austria, the German-speaking area of Switzerland (plus Geneva), Alsace-Lorraine and the Low Countries for every hundred year period between 800 and 1800 AD. These institutions are (i) the existence and degree of guild participation in the city council, (ii) the existence of a participative election mode of the city government and (iii) whether there was some kind of institutionalized burgher representation (e.g. a regularly meeting community assembly). As the overall effect of the universe of participative political institutions is of interest in its own right he also develops a single variable representing the overall impact of those institutions. This variable is obtained by conducting a factor analysis with the individual measures of participative political institutions. Furthermore, the author makes use of the comprehensive city level panel data set of Bosker et al. (2013) to supplement the data on participative political institutions. This data set also contains a variable for the existence of communal institutions in cities and hence enables to assess the effect of the participative political institutions at the extensive margin. To become familiar with the data, it could be instructive to have a visual view on the main data used in the study. Therefore, Figure 1 shows a map visualizing the spatial pattern of participativeness of political institutions in the sampling area. To be precise, the maps shows which city belongs to which quantile of the Participative Institutions Index (averaged over all time periods) distribution. Thus, larger circles indicate that a city belongs to a larger quantile. The highest degree of participativeness is shown by the institutions in cities located in the western (especially south western) part and middle part of Germany, while in the Low Countries, the east, south-east and north of the sampling area participativeness is not so pronounced. The area with the most participative political institutions thus approximately corresponds to the area of the highest political fragmentation, the area were the most free and imperial cities are located and were many important trade and production centers are located. The consequences of participative political institutions on city development are investigated by means of panel data regressions that allow to introduce e.g. city fixed effects to account for time-invariant heterogeneity. First, I consider the effect of each kind of PPI individually and then I present results using the single index. 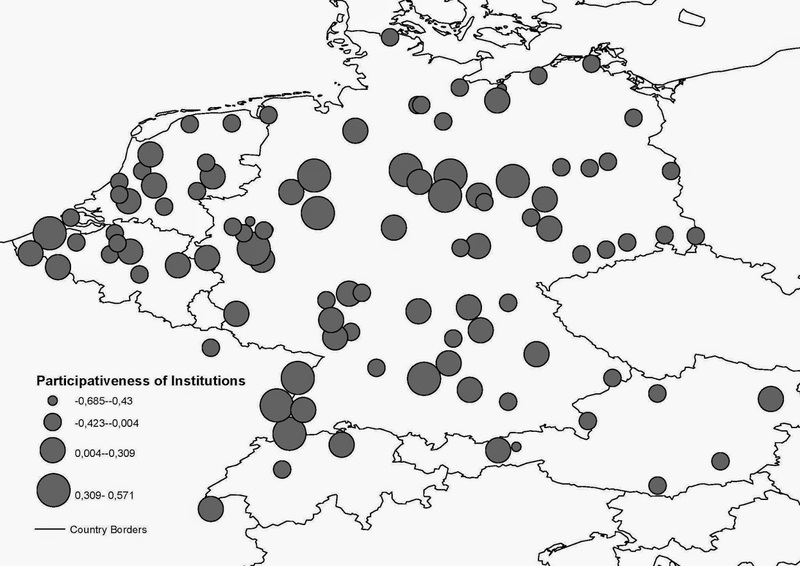 Separate regressions are conducted for the medieval and the early-modern period and for the Low Countries and the German-speaking area and the institutional variables are interacted with century dummies and indicating whether a certain type of participative political institution had already existed for one, two, three, four, five or six centuries in a city in a certain century to test for spatial and temporal heterogeneity in the effect of PPIs. From the empirical analysis, several important results emerge. When considering the effects of the different types of PPIs individually and pooled over all cities and periods, the author finds that primarily the extensive margin, i.e. the existence of communal institutions like city councils, had a robust and positively significant effect on city population. However, in the German-speaking area the existence of participative elections had positive effects on city growth. 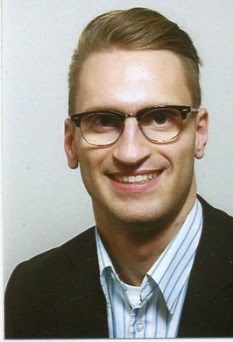 Regarding the notion that existing political institutions and regimes are subject to a process of degeneration and increasingly egoistic, rent-seeking policy the author finds a pattern of an increasingly negative effect the longer an institution existed, in the case of cities with guild constitutions. 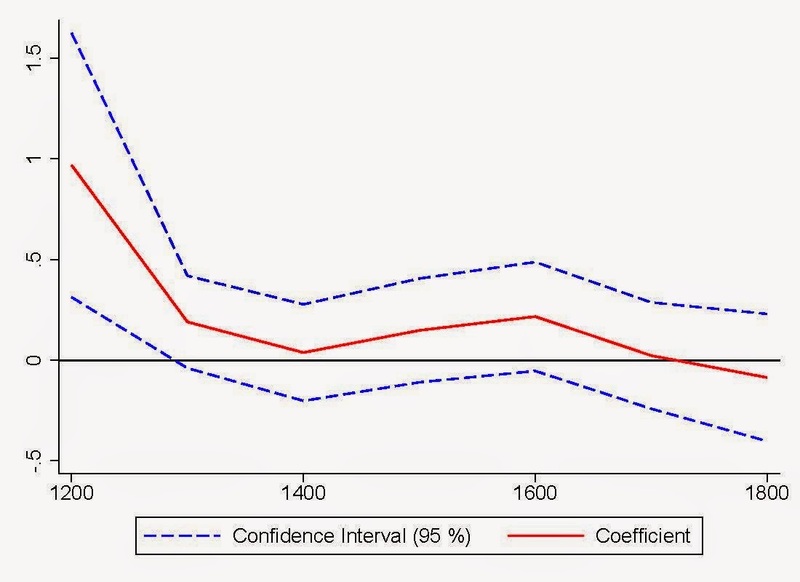 In addition, participative elections only had a significant positive impact in the first century of their existence and afterwards the effect became smaller and insignificant. This highlights the short-lived character of the positive impact of participative political institutions in pre-modern cities. When considering the Participative Institutions Index as measure of the overall impact of the different types of participative political institutions, there is only weak empirical evidence for a significant positive impact. However, the positive effect is stronger in the German-speaking area and prior to 1500 AD. Finally, the author investigates the temporal evolution of the impact of participative political institutions from their first occurrence in 1200 AD until 1800 AD by interacting the participative political institutions index with century dummies. Figure 2 shows the resulting coefficient of the interaction term and the 95 % confidence intervals. For all observations the study detects significant positive effects in 1200 but insignificant effects in the other centuries. This implies that while these institutions contributed to the commercial revolution and the rise of cities, their impact in later centuries was limited. Companies were the principal institution through which investment was channelled into the nineteenth and early twentieth century economy. 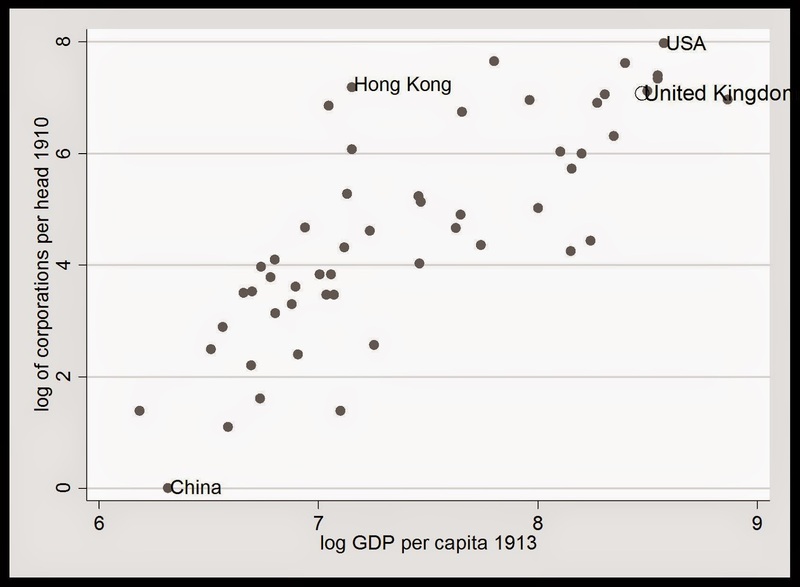 The close cross-country correlation of company numbers and GDP around 1910 is therefore no surprise (figure 1). In the top right of the figure are the United States and other regions of recent European settlement. Just below them, and almost as intensive in companies per head of population, is one of the largest and certainly the richest of the ‘old’ countries, the United Kingdom. Although companies created opportunities for higher productivity and income in nineteenth century Britain they also were an unprecedented chance for fraud and misappropriation of shareholders funds by unscrupulous directors. In Victorian literature dishonest companies and their officials abound – Charles Dicken’s Anglo-Bengalese Disinterested Loan and Life Assurance company (Martin Chuzzlewit 1844) and Anthony Trollope’s financier Augustus Melmotte in The Way We Live Now (1875) are instances. 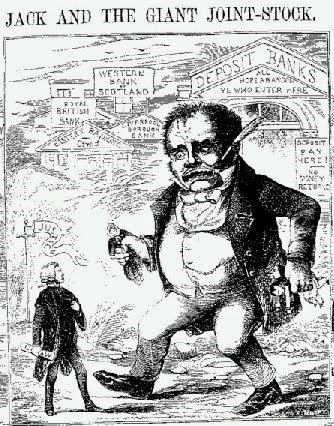 Satirical cartoons in periodicals pilloried crooked and predatory directors - figure 2 represents the law as the giant killer of a joint stock banker. These concerns might reflect the widespread damage that such companies wrought. But given the correlation noted in figure 1 it seems more likely that public concern gave rise to a regulatory framework that controlled such potential damage. Yet the consensus among legal and economic historians is that British law between 1844 and 1914 provided little protection to corporate shareholders. We contend that the consensus is mistaken. Figure 2. Cartoon satirising speculation and fraud in joint stock companies, from 1858. Until towards the end of the nineteenth century, statutory companies accounted for the great bulk of capital quoted on UK stock exchanges. These companies were subject to the Companies Clauses Consolidation Act (CCCA) of 1845 that required substantial shareholder protection. The Act prescribed corporate governance and liability rules for all subsequent statutory incorporations in 164 model clauses. Hence the traditional view that legal compulsion played no role in nineteenth century British corporate governance is only sustainable for the companies registered under the much laxer Companies Acts. Yet we find evidence that even these companies usually voluntarily adopted governance rules that were very similar to those compelled by the CCCA for statutory companies. The professionals guiding registered companies through the process of initially offering shares to the public probably were “nudged” by the earlier legislation and the default table A of the Companies Acts. The role of law in spreading good corporate governance practices in British quoted companies therefore has been underestimated. Shareholder protection by corporate governance is now sometimes summarised by “anti-director” rights. The CCCA rules score quite highly on this index. Clause IX allowed attendance at general meetings of shareholders whose names were on the register, without the deposit of shares , scoring one on the index. In contrast to the lax Companies Acts, shareholders under the CCCA had rights to new shares if existing shares stood at a premium to par value (clause LVIII), increasing the score to two. Holders of at least one-tenth of the share capital could requisition an extraordinary general meeting, if the directors failed to do so within 21 days of a formal request (clause LXX), increasing the score to three. Proxy votes were routinely allowed, if the nominated proxy was also a shareholder (clause LXXVI), raising the score to four. Tiered or cumulative voting rules were probably intended to protect minorities against majority oppression (raising the score to 5), though there are other interpretations. UK statutory companies under the 1845 CCCA then generally scored four or five out of six on the anti-director rights index. This was a level not legally required in the UK registered company sector until the last quarter of the twentieth century. Moreover boards of CCCA companies wishing to modify their statutes had to obtain parliamentary approval, deterring directors from attempting prejudicial changes and giving shareholders an opportunity to lobby against them. The obligatory provisions for removing directors and calling extraordinary general meetings also made boards reluctant to introduce major strategic moves without consulting a shareholders’ meeting. Turning to registered companies, our investigation considered changes actually made in their articles of association before applying for stock exchange official listing. These show company promoters recognised that encouraging good corporate governance brought advantages for raising capital. Articles of association of large registered companies submitted to the London Stock Exchange Listing Committee show high scores on the anti-director rights index, even though the Companies Acts did not require it. The freedom to attend meetings without prior share deposit and proxy voting were universal in our large quoted sample, and only two companies failed to provide for minority rights to call a meeting. Pre-emption rights were more varied, but the general requirement for shareholders to permit any increase in capital usually gave those without explicit pre-emption rights the power to insist on them as a condition of any issue. Thus many registered companies scored four (or, on a stricter interpretation of pre-emption rights, three) on the anti-director rights index. In the complex Victorian commercial society an (endogenous) culture of business morality and reciprocal trust, as well as the long arm of the law both played roles in creating an efficient business environment. That they did so was among the reasons why the London Stock Exchange remained the largest in the world before 1914. Their joint effectiveness also explains why numbers of companies with ownership substantially divorced from control was comparable to those of today. Nineteenth century British ‘anti-director’ protections for shareholders were not as different from today’s as legal analysts have suggested.